stimulating the production of collagen and elastine. 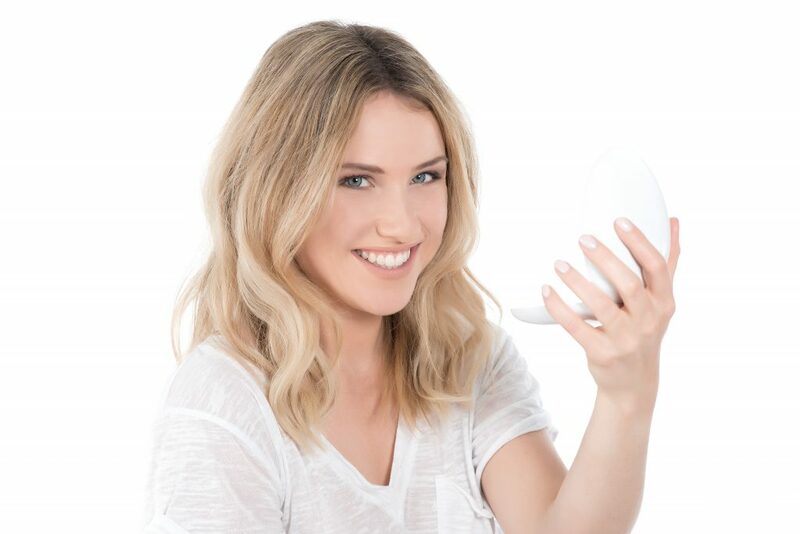 Proven results : day after day, the oval of the face seems to be redesigned. AGELIGHT improves skin density and firmness, diminishing fine lines and wrinkles. Anti-aging : To reduce fine lines and wrinkles and improve the elasticity and tone of the skin. Anti-dull skin : To improve and homogenize the skin tone. Anti-blemish : To reduce blemishes and provide a soothing feeling. earning three certifications, one patent and seven regulatory approvals, for your safety. BIOLUX offers a mobile application to help you deal with your beauty rituals. Manage your beauty agenda, and receive the latest news and beauty advice. WHO CAN USE BIOLUX TECHNOLOGY ? AGELIGHT skin cares are compatible with all skin types (sensitive, white, suntanned, black..). HOW TO USE AGELIGHT DEVICE ? Before use, cleanse your skin to remove makeup or creams. To start AGELIGHT, open it. Use UP or DOWN to select desired treatment (Antidullskin, Antiblemishes or Antiaging). Press OK to launch the protocol. Place the device following the treatment parameters (Position the device at 10 cm from your face (length of mirror) to cover the three zones left/center/right;change the zone when you hear a“bip”:). When the treatment is finished, you hear a bip. The device turns off automatically. The anti-dull skin protocol can be performed everyday, preferably in the morning, to make your skin glowing with health. This daily skin care is completed by an anti-aging program once a week to fight sagging skin and to maintain its elasticity and firmness. The anti-blemishes program should be used in case of appearance of blemishes and/or sensation of heat providing an immediate soothing feeling.